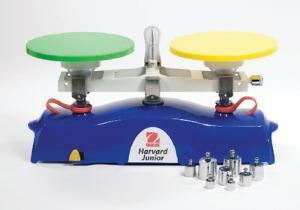 Harvard Junior balances are two-pan balances designed for comparative weighing. Plastic pans and bright colors invite younger students to experiment with early measurement and weighing activities. This balance features two interchangeable bowl-type pans that fit over the standard flat weighing platforms and allow for holding and weighing round objects without rolling off the surface. Its built-in handle and lock provides added protection by eliminating oscillation and preventing unnecessary wear during transportation or storage. The balances include a comprehensive, teacher-created activity guide with background information, vocabulary terms, reproducible worksheets, and seven activities for PreK-5 science and math classes. Ordering information: Three-year manufacturer's warranty included with purchase.